This is without a doubt the BEST toy Rory has received in a long time. It is called the Tricky Treat Ball from Omega Paw and I cannot begin to describe how impressed I am with its design, philosophy and durability. 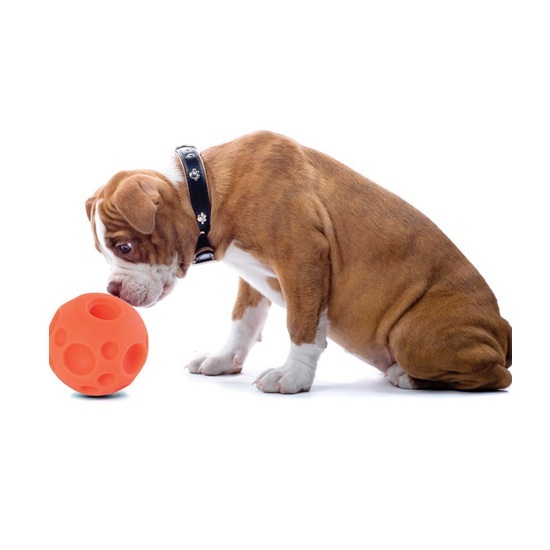 To begin with the Tricky Treat Ball is what is referred to in the pet industry as a ‘brain toy.’ Now that is not because it looks somewhat like a brain, but rather because it forces your pet to think. 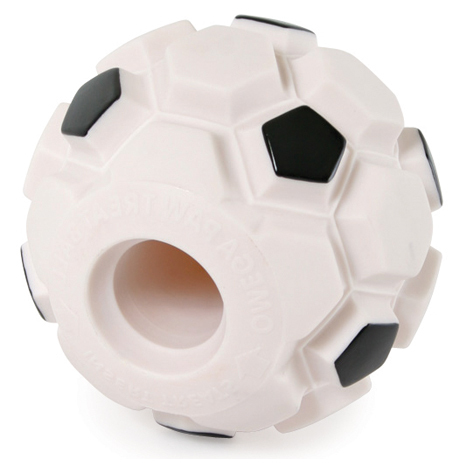 Punctuated like a little moon with substantial craters, the ball has one opening where you place within it your pet’s favourite treats. Your pet must then nose it around until the treats fall out one by one. 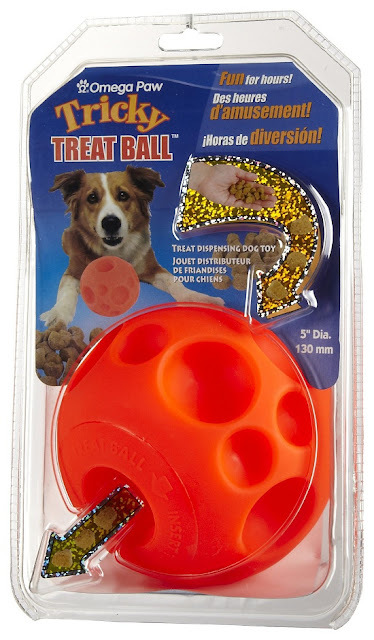 There are a lot of toys like this on the market today that suggest you hide treats inside to stimulate play, but usually Rory either finds a way around the design by chewing right through the toy or the treats just fall out without any effort at all. The Tricky Treat Ball, however, provided a pleasant surprise. Not only is it impossible for Rory to chew, but it’s claim to hide treats actually works! Once inside, the treats do not come out easily. Even when I shook it vigourously only one or two pieces of kibble fell out, thus ensuring hours of fun playtime for the pets! Rory had to be taught how to play with this toy, because it is unlike anything she’s had before. Of course, being the clever little dog that she is, she did attempt to ‘train’ her humans and have us continue to do all of the work so that she could just mosey along behind and gobble up the tasty insides! So watch out for that if you try this toy with your pet. Fortunately, we caught on to her sneakiness and she soon caught on to the fact that it was up to her to reap the rewards of the brightly coloured, oddly shaped contraption. The fact this ball also makes a rattling noise when filled with treats is an added plus as it further commands your pet’s attention. Great for warding off boredom, providing a mental workout and generating a lot of play, The Tricky Treat Ball is a wonderful interactive toy! There is also the related Fitness First Ball that operates with the same principles at its core. The only difference is that it looks like a soccer ball. Cute, but we prefer the oddity that is the wacky orange. Has your pet tried this product? 2 Comments on Tricky Treats! My parent’s lab had the orange one. She loved it. While visiting my destructo-mutt was able to put a new hole in it (within about 30 minutes of having it). She was not patient waiting for the treats. Given the lab didn’t destroy it, and my dog has super destruction powers, I would still say for the average dog this would be a great toy!